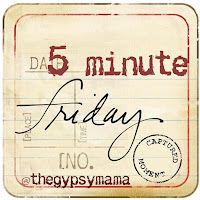 I’m linking up today with Gypsy Mama for Five Minute Friday. On 5MF, we just write for five minutes straight with no backtracking or tweaking. Just type it out as it falls right out of your head. When you’re done here, be sure to head over the Lisa Jo’s page and have a read over some other 5MF contributions! The waters are swirling…seeming to overcome. The roaring of the waves as they crash are deafening. The creaking of the boat as it bounces and pitches around in the tumultuous sea may imply that it would come completely apart. The fearful cries of grown men ringing out across the water as they begin to wonder if they will make it out of this thing alive. Is there really something on the other side of this sea that’s worth all this? And in the middle of it all, where is He? Asleep in the bow of the ship. Complete chaos all around Him, and the Lion of Judah lay at peace, resting in the midst of it. Those in His presence had nothing to fear. The waters know Him by name. The winds had heard His voice since they blew for the very first time. But yet, those who followed Him succumbed to their fear. The roaring of the water as it crashed into the boat shook them to the very core. And they called out to Him. The roar of the storm could not overpower the hushing by the Lion of Judah. He was in the midst…He is in your midst. He is hushing your storm, quieting your raging sea. Shhhhh. Can you hear Him? Hush now. It’s going to be alright. He roars louder than anything else can, even if it is only a purr. Amen! Oh my, He sure does! Thanks so much for stopping by! Thank you so much for stopping by! Blessings!